at which point I received a tinyurl address, leading to a malware delivery site. But I received again a tinyurl encoded address to which I didn't reply further. Seeing this primitive dialogue, I suspect there is a malware with some chat boot embedded or a low-wage worker in the 3-rd world. the status bar shows the download as being an .exe, Firefox removed the status bar at all before FF4 and restored it after the users outcry, it shows it was a wise decision. What can I say? this is a pretty sophisticated attack, combining AI (bots), social engineering, competent crafted design and advanced use of facebook APIs. Be careful! PS: of course nothing bad happened to me, I spotted the URL instantly, noticed the .exe and don't run Windows anyway. 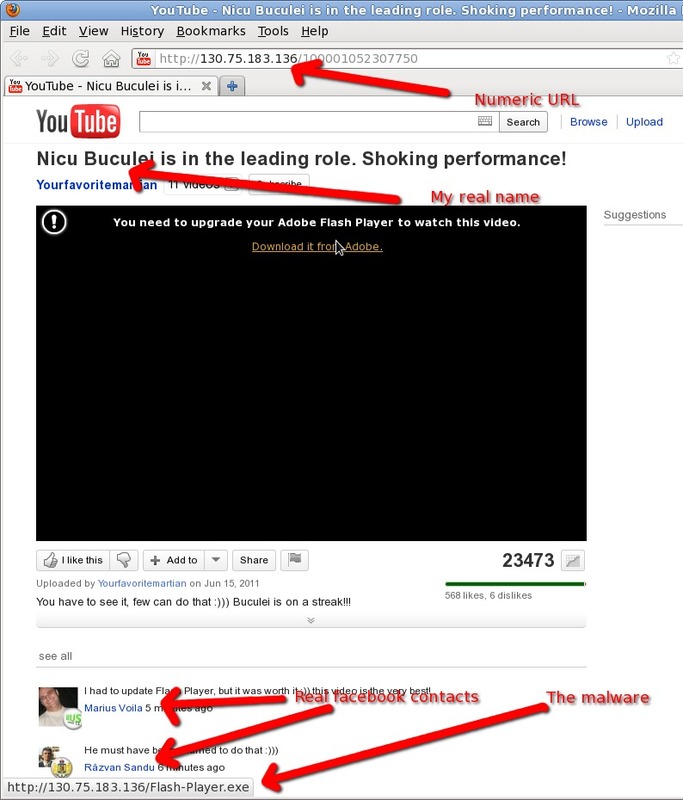 "the numeric URL is the first thing to give it away as malware, unfortunately some browsers, like Chrome, will hide the URL bar by default, leaving the user more vulnerable (Furefox is expected to blindly copy this feature too, making even more naive users vulnerable)"
I am not sure where you got that from, but Chrome certainly does not hide the URL bar by default. There are mockups of UI experiments, but they are just that. Both Firefox and Chrome developers are quite aware of the phishing problems of hiding the URL bar, as well as the problems of relying on it for most people. Perhaps you have confused this with hiding the http://, which has none of these problems. As long as you did not download adobeflash.exe you're ok. Clicking the link by itself does nothing. My approach to this was "I did nothing special so a video about me getting popular on the web must be fake." I also received two of these simultaneously form two friends with the same "wanna laugh" greeting. Needless to say this is as far as I got. Does anyone know if the person the malware is impersonating is aware of the chat? i am on Linux, i could even ran the malware without consequences! And to me the same thing happened! Chances are that you receive while you are online on Facebook and chat will begin with a simple "hi". Regardless of your answer the second message is "wanna laugh?)))" And the next answer will give you will receive a link. Once pressed you will see the page that looks very much like youtube and the video will tell you to upgrade your flash player. CAUTION Do not press TO DO THE UPGRADE. OYTE THE PAGE YOU IS youtube NOR THE FILE IS SET TO FLASH PLAYER. If you look at ADDRESS TO THE PAGE YOU WILL SEE THAT went INSTEAD OF YOUTUBE HAS NUMBERS. THIS PAGE IS IN RUSSIAN SERVER and the program refers aims to collect data from your computer. This file is not a virus and antivirus you probably will not recognize it as a threat. "The file could harm your computer. Are you sure?"